Force 8 is a leading manufacturer in arched windows and doors and we are known nationwide for being the only company to offer a one-piece arched frame using our leading technology and state of the art techniques. This is a door that we recently installed in Sale, Trafford. What makes this design so unique is its a Toadstool design composite door. After looking into this design, we are one of the only companies that seems to have created a door design like this. After we installed this door, the neighbour saw us install this and was thinking into investing into this as well. With this being a design that hasn’t featured in one of our door collection brochures, this allows us to be able to develop new and innovative designs that you won’t see anywhere else. To further this, this allows us to be able to design more doors like this in the future as it has allowed us to develop on our creative techniques. Each of our doors is available in standard and premium colours with a further 210 RAL colours to choose from. You can choose from our wood grain effect texture or our exclusive smooth finish. 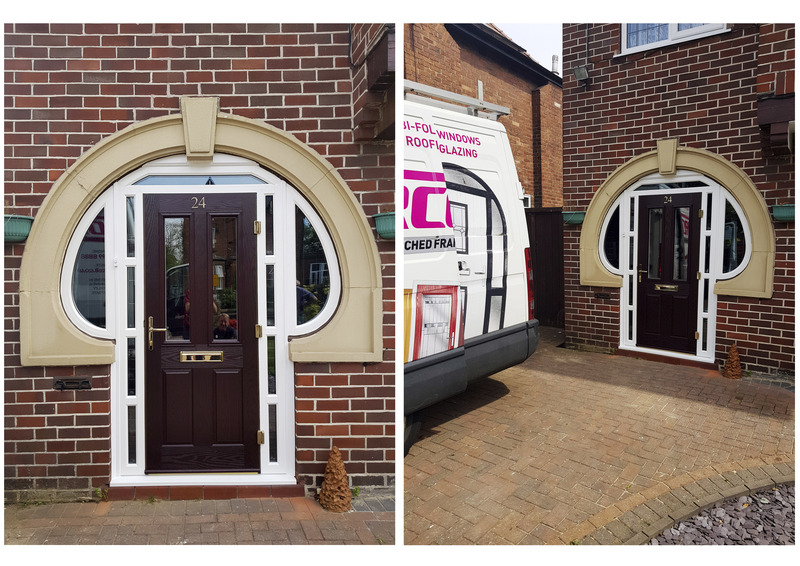 Don’t hesitate to contact Force 8 is discuss our many arched composite door options and how we can produce a design for you.